Nike Air Jordan Shoes 2011 for Sale? Just recently, Nike released a new retro version of the hugely popular Air Jordan sneakers, first released in 1984 and was very popular during the time of the reign of Michael Jordan and the Chicago Bulls. the recent release of the new version in the US reulted in early dawn vigils at US stores selling the basketball shoes with shoppers turning to violence, shoving and pushing just to get it. Some even went to jail in their violent attempt. Now, where can i buy the Nike AiJordan shoes 2011 edition online or anywhwere in the Philippines? how much is it here? Any price update for Air Jordan shoes? I'm now an owner of shiny new Toyota Innova E 2.g DSL since last week. And since it's new, still has no plate numbers but was able to get home to Quezon City and Makati via San Juan and Mandaluyong, not via EDSA nor C5. For now, I'm using Toyota Pasong Tamo's delivery receipt valid for 7 days that I need to show to traffic enforces (MMDA or MAPA/MAPSA in makati) or the Land Transportation Office (LTO) or PNP TMG (traffic management group) manning checkpoints. I've yet to mark the first week of my car's life outside, odometer reading's still around 64 kilometers. I have several post-dated delivery receipts to use after seven days to renew my seven days grace period of "exemption" from the no plate, no travel policy. But i think as long as it's taking a long time, a smart police or traffic enforcer can ask your odometer reading to know if your car's really fresh from the CASA. I intend to take my Innova to Bolinao, pangasinan next month, I hope to receive my plate number by then so that I don't have to be nervous to pass by NLEX and SCTEX or even SLEX and Startoll. Violations and fines for new cars without license plates apply plus possible impounding of your new car until you show the LTO registration OR/CR or license plate with stickers. This No Plate No Travel policy is stupid for the government makes it hard for citizens to use their new cars caused by the inefficiency of the LTO in the quick release of license plates. MMDA recently announced that it will suspend the implementation of number coding on Monday, September 19 to enable vehicle owners to use their cars during the planned transport strike. Note that number coding in Makati is not suspended. There's always no color coding suspension in the Republic of Makati, don't press your luck. pasaway na drivers beware in the republic of Makati with the new ordinance to take effect on September 16, 2011.
driving motor vehicles under the influence of liquor or drugs, in addition to the P2,500 fine and/or imprisonment prescribed by the 2003 Traffic Code for the first offense. The city will also recommend to the Land Transportation Organization (LTO) the suspension or revocation of the drunk driver’s license. ban on tricycles on national roads in the city, including all roads within the central business district. The penalty for violators was also raised to P1,000 from P500, in addition to impounding of the tricycle. Tdriving over a yellow box—the portion of the intersection marked with yellow lines that should be kept clear of all vehicles at all times—was also increased to P1,000 from P500 for the first offense. Disobedience to traffic control signals, on the other hand, will entail a fine of P2,500 and/or suspension of driver’s license and, for a public utility vehicle, suspension of Certificate of Public Convenience. business establishments will also be required to refrain from serving liquors or intoxicating beverages to customers driving a vehicle. They are also required to post reminders against drunk driving in conspicuous areas in their place of business. Establishments that fail to comply with this provision will be slapped with a P2,500 fine and suspension of business permit for the first offense. I don't know about the third judge, but Kris Aquino and Ai-ai delas Alas don't deserve to be judges of the talent show, thinking people will notice. No premium on originality, i saw a boy trying hard to mimic Bruno Mars got high marks...for a show really looking for talent, a premium should be paid for originality, nothing "plakado" or just gaya-gaya, puto maya. you're looking for great talents, not "secong rate trying hard, copycats"
The DVD has an catchy theme song particularly the closing scene of Tokyo Mater where Mater became the Drift King. I can't find the song/soundtrack on torrent and information on Pixar's official blog is sketchy. I found the song on YouTube and just converted the sound on it using an online TouTube to MP3 converter. Now my son's dancing to the music from my mobile phone. I'm an active OpenStreetMap volunteer mapper using Potlatch 2 online editor. What I noticed beginning from Firefox 3.6 was that my browser will always go slow, hang or crash for a few weeks already. What I did was update my Firefox to the latest version even all Firefox add-ons and extensions but still the Firefox crash persisted. Using the latest version of Firefox 4 and yet the problem returned after a few days of stable operation. Solution? Fire up Google Chrome browser and no crashes. Even Internet Explorer 9 can do but don't recommend it from Microsoft. I use Firefox for Blogger, IE9 for OpenStreetmap and Blog Facebook and Google Chrome for this. If any of you is looking for genuine JDM car parts from Japan, there's a car parts shop specializing in this area. They import their products directly from Japan and now doing the same for Korea (Hyundai and Kia surplus) in addition to their usual Toyota, Honda, Mitsubishi cars. They import them in bulk with whole engines and shipped in containers, pass by customs (yes, they're legit and legal, unlike others whose products provenance come from carnapped vehicles. If it's ok for you to buy stolen stuff just to save money, may the fate of the carnap victims not befall on you too). Will update this post once I get the telephone number and some sample prices. I'm gonna get me a Toyota purge valve solenoid for my Toyota vios (part number 90910-12202) that's turned on my yellow check engine light on my dashboard. Toyota Charcoal Canister or EVAP Purge Valve Solenoid Problem with Error Code P0443? While idling for quite some time on Trinoma access road, my yellow check engine light came on. Since I have my own OBD II diagnostic scanning tool, i immediately checked it out and came with P0443 error code that points to the evaporative purge solenoid circuit. 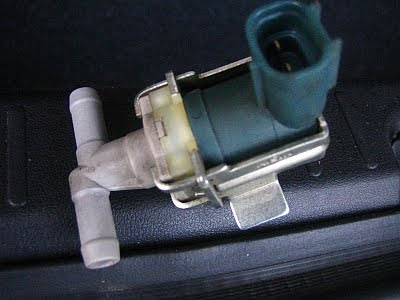 I'm already familiar with the evaporative component of modern carsas it's responsible for storing gas vapors from the gas tank in the charcoal canister then the purge solenoid supplies the gas vpsors to the throttle body to be used as fuel, therefore maximizing use of fuel and eliminating emissions. I reset the code and it disappers, only to re-appear after a few minutes of driving. Yesterday, after doing a DIY interior detailing jpb on my car, I opened up the hood, yanked the two hoses from the purge valve solenoid, sprayed generous amounts of WD40, let it dry then reinstalled it then restarted my Toyota Vios. Voltage tests and continuity checks of the solenoid coil turned ok.
Just when I decided to bring the purge valve to Jay N Jer for replacement (with guarantee to return if it's not the real culprit since I know the owners), I noticed the one of the wire connectors to the valve is open, with the rubber insulation hiding it. I just cut the wire and made a direct connection to the valve connectors. Been 4 days and yet the malfunction indication light didn't return, electrical open and not actual valve failure. Wifey went to Petron Car Care Ortigas (near The Medical City) to have a tune up of our Sakura, our Toyota Vios when we decided to visit the nearby MC Home Depot just walking distance. It's inside that a man offered something to my wife who came to see what the offer was. The Aowa sales man was too inquisitive and too eager and asked me personal questions but I merely deflected to wifey. Then when wifey seemed too interested in the Aowa induction cooker, another man brought up his cellphone then called up his boss who shouted "talaga ma'am?" and announced my wife just won a promo only for the day and began surrounding wifey with freebies that we can buy for P40,000.00 including the induction cooker, air purifier, electric kettle, aircon, ionizer and other electric appliances. My usual cynical self came into play when I noticed the man who called his boss lacked the usual reaction of surprise, "kulang sa acting skills, ika nga." Even hinting that we can store the appliances to be used next year so we can avail at a very great dsicount. As I was trying to deflect their insistence on us buying all the items for "cheap" P40k, wifey almost gave her credit card just to have a balance inquiry when I said "No." I simply made an excuse to all the sales people surrounding us that even if what they're selling are checp, it's still expensive to me for I don't need them. We left the store and thank goodness, my wifey survived the test that made me shiver at the thought of buying Aowa appliances where I don't even know if they're reliable and if Aowa Service centers really exists in case of repairs. Anyway, their style is typical of misleading campaigns that the Department of Trade and Industry (DTI) should look into, but knowing how lazy government workers are, I doubt it seriously. Traffic to my main blog just skyrocketed as it's summer nearing Holy Week coupled with the upgrade to PR5 by BFF Google. What gives? Do I have to get rid of the blogbank code on my main blog and write off my "lost income" like what I did with other scam ads site? An unspecified magnitude earthquake felt in Makati and Quezon City, probably Metro Manila but not felt in Laguna. I've yet to know the magnitude from Philvocs and USGS and the epicenter, not too strong actually for a tsunami unless it's really strong. I saved the draft post, closed my IE9 window then fired up Google Chrome, logged in and open up the draft post on the Edit tab of Blogger, it's not published. hope it's just an IE9 hiccup! BSP, Banco Filipino Bank Run, Bankruptcy or Bank Holiday? Last Tuesday, Banco Filipino depositors, clients and account holders were surprised to see all banco Filipno branches closed and only security guards at the baking premises to tell irate people to go back when Banco Filipino will open again. Want to know the truth about Banco Filipino and other latest news? Well it's such a complicated and long history behind the battle between the bank and the bank regulator. The rift between Bangko Sentral ng Pilipinas (BSP) and Banco Filipino dates back to the time when BSP (thru the former central bank of the Philippines) ordered BF closed but later re-opened. The Supreme Court already ruled the BSP closing of Banco Filipino was arbitratry. Banco Filipino has a pending case against BSP because of this asking for compensation while it is also BSP job to help banks asking for assistance, part of their job as regulators. Will Banco Filipino re-open and not close temporarily and not permanently? I think so. They have been closed before and will be able to do it again. They've been through tough times and also did you notice the Philippine Deposit Insurance Corporation (PDIC) did not step in? Banco Filipino is not really bankrupt, they still have PhP18,000,000,000.00++ in equity but they got an overdraft last weekend and so wanted to borrow P3B from the BSP that BSP didn't provide. Banco Filipino decided the next day to temporarily close their bank. I suggest in the best interest of Banco Filipino clients and the banking industry in general, BSP and banco Filipino iron our their differences to help Banco Filipino out of the current mess. Enough of the bickering on national TV. I'm from the banking industry, but not a Banco Filipino insider. I learned about Banco Filipino early this week but didn't disclose them in this pathetic blog (that nobody reads anyway, unlike my main travel blog), due to sensitivity of the Banco Filipino news (but i'm privileged enough to be aware of some of the real scoop). The information has been made public already with Banco Filipino and BSP people, lawayers, trading barbs with Banco Filipino claiming it's BSP's fault and the source of the smear campaign against Banco Filipino. As of now, Banco Filipino branches are closed and ATMs offline to stave off mass withdrawals of depositors and avert a bank run. When I asked someone to verify while I apply the brakes, the left "stop light" also is intermittent. When I opened the hood and checked the wiring (Toyota vios wiring diagram is pretty straightforward) the light went on and I simply returned the wiring harness back. The next day, I checked the third brake light by removing the light assembly by simply pulling towards me then lifting it up to reveal the busted light bulb. I again checked the tail light assembly and this time I discovered the second brake light is also busted-- I was driving with just one brake light on, such a dangerous one but glad I'm just on slow moving traffic. I simply bought the two busted brake lamps at the nearby auto supply shop near Munoz, Quezon City for just P35.00 and installed them. Now I'm back to the safe side, three brake lights working. Park lights and head lights and fog lamps, hazard and turn lights all confirmed working. With my impending replacement of my aging Nikon D80, I'm also mulling a return to the Canon world again with the reccently released Canon 60D to replace the Canon 50D. How much does the canon 60D costs in Hidalgo, Quiapo, Manila? How will Canon 60D vs Nikon D90 and Nikon D700?